Highlight the shapes and strength of the natural world using the American GardenWorks Black Nature Trellis. Tendril and leaf shapes throughout this unit bring a dramatic look to your garden, enhanced by its all black color. Two 0.25" diameter, upright steel rods create the frame of this piece, their thick shape providing plants with several places to grip as they grow. Curved, solid steel rods twist and arch upward, mimicking tree branches, and leaf figures on these pieces further the theme. Additional, horizontal steel rods form a grid, for support throughout the item, and its black, powder coated finish keeps it lovely and durable. Insert the two, 13.5" long legs into the soil in your garden for a wonderful display. The black color and top orbs add a classic look to the item, and the powder coating on the piece ensures it will withstand the elements year after year. 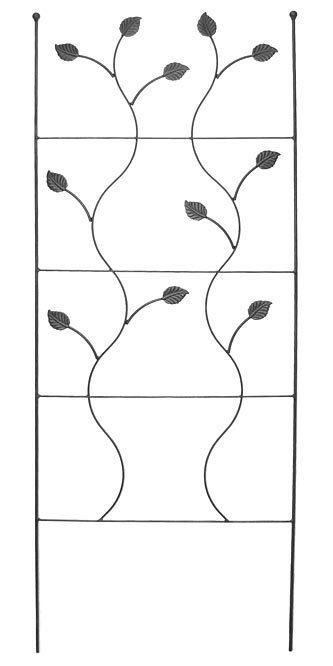 Turn your landscaping into living, natural art with this Black Nature Trellis. Made in the USA.